We have Just Sold out of Star Wars Galactic Heroes Featured Figure Wave 3 Case. Not to Worry! Fill in the Notify me When Available and you will be the first in line for our restock of Star Wars Galactic Heroes Featured Figure Wave 3 Case !! 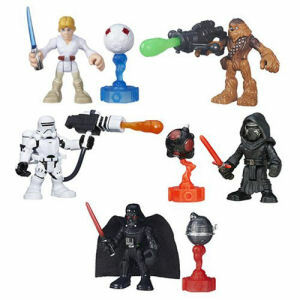 From the Star Wars collection by Hasbro. Star Wars Galactic Heroes Featured Figure Wave 2 Case. Case includes 8 individually packaged figures - 1 LUKE SKYWALKER EP IV - 2 DARTH VADER EP IV - 2 KYLO REN - 1 FIRST ORDER FLAMETROOPER - 2 CHEWBACCA. Each Galactic Heroes figure has jointed wrists - legs - shoulders - neck. They measure 2 inches tall.